What a weekend! We’ve been holding three competitions within one tournament during the weekend. After the first breakdown we had Warriors, Rauma, Wan Chai and HRC2 in final. The Warriors Captain showed a terrific ability and finished his beer in a world record time! In second came HRC2. The 6 remaining teams started their game at 9:00 or 9:25. Although only a few teams the quality of play was still superb, with the ladies putting everything they had into the game. Jyväskylä RC won their two games against Warriors RC and Helsinki RC. Warriors RC won against Helsinki RC, which meant Jyväskylä got to take home the Ladies Baltic Plate, this year at least. What a great tournament! The level seen in this weekend has never been seen before in Finland. We first saw a great pool series, with 3 series of 4 teams and each team playing 3 games. Then we sorted the winners and decided we would be playing in the quarter according to the results and goal average of the pools. The Baltic Shield which gathered the teams who couldn’t make it to the 2nd round showed some excellent Rugby especially from new small clubs from Finland. Rauma Ice Pack, Rovaniemi Rugby Klubbi, Helsinki Rugby Club 2 and Finland U20 were qualified. The Final between Helsinki Rugby Club 2 and Rauma Ice Pack has been fantastic and thrilling with an e xtra-time sudden death round. After 2 x 12 minutes, the two teams couldn’t decide who was going to win. In the 3rd minute of the extra-time Glenn Badger, the kiwi winger of the 2nd team went for a wonderful 50 meters try giving the victory to Helsinki Rugby Club 2. 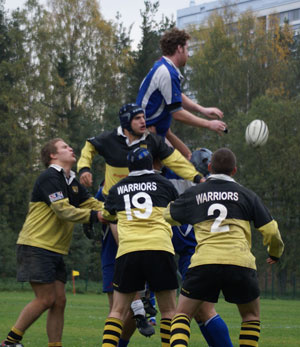 Helsinki Rugby Club against Warriors Rugby Club. The boys of HRC had their revenge of the season beating WRC by one try only. Very tough game! Tallinn Sharks against Attila of Sweden. The title holders, Attila, had to fight fiercely to beat the Estonians. 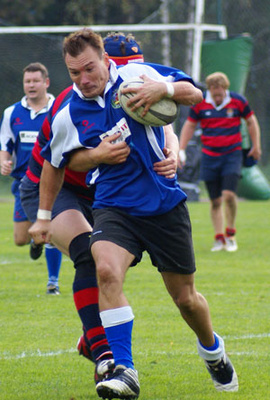 UTM Moldova against Northern Stars. (a combined team of Jyväskylä Men and Oulu Rugby Club)The team from Moldova which travelled 1900km by bus wasn’t coming for picking berries and mushrooms! The made it through the semis showing a very good level of Rugby! HRC against Wan Chai Wanderers. The Wan Chai came in great number and some good shape despite the heavy drinking nights we’ve been told about… After a good 1st half from HRC (5-15). HRC released the pressure and had a lot of trouble containing the power of Wan Chai Wanderers. Some smart moves and some good ball handling from the Wan Chai made them through with a comfortable 5-30. UTM Moldova against Attila. Again Moldova made it through. Attila just faced a bigger team this year. After several years playing the Baltic Plate and winning it Attila had to fight harder but couldn’t make their way through the solid defence of the Moldovians. Two big teams. University of Technology of Moldova against the Wan Chai Wanderers. UTM Moldova was present at the Stockholm Ten’s this year. 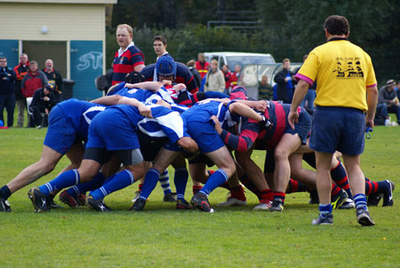 This tournament is a reference in the amateur rugby tournaments in Europe and they had a remarkable result. With a good team like that we expected to have some good show! Wan Chai Wanderers is a touring team from Wales - the country where everybody plays rugby. They are playing regularly in Hong Kong Tens and some other nice places around the globe according to their t-shirts! After a very rough 1st half where the teams defied each other with strength we started to see some good 10’s rugby. UTM clearly master the subject finding breaches in the defence more easily than the Wan Chai. Some tough tackles and some illegal use of the boot threw players from each side in the sin bin. The Wan Chai threw everything they could to stop UTM but with mostly very fast players and quite few powerful ones they could outnumber the Wan Chai very fast! Once again the final went in to a sudden death, with the full time score being equal at 5-5. So sudden death was the order of the day and this decided who would be the 2007 Baltic Plate champions. UTM wanted it bad as they scored first and sealed their victory. UTM won the 7th Edition of the Baltic Plate! This was by far the best Baltic Plate ever, and can only set a marker for next year's competition. I agree that this was a very good tournament with some good rugby played by many of the teams. It was a great experience to play in Finland which wouldn’t be the usual touring destination for many UK teams. However, I feel for rugby to progress in this part of the world the level of refereeing needs to be looked at. The interpretation of the referee at the breakdown was difficult to understand as many of the teams we came up against basically only tried to kill the ball. The referee did very little to prevent this and did not allow us to prevent by using boots in a legal way. Having said that, the Moldavians probably were deserved winners, in the end. They were a strong well organised outfit and they played the referee very well, where we lost our heads with frustration. I hope we can return to the tournament next year and maybe go one better and win it.